A new class of portable and wireless computers are being introduced into the marketplace by Microsoft and hardware providers called the Tablet PC. 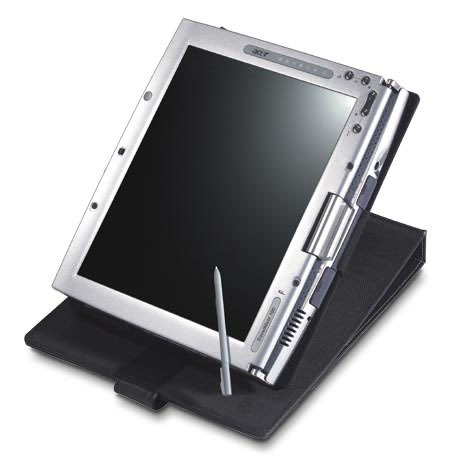 The main user interface centers around using a pen to interact with the computer. This presents many challenges and opportunities for innovative pen-based user interfaces. The Chameleon is a spatially-aware display and offers an alternative style for interacting with a virtual reality. The original version was designed to be a handheld, PDA size unit. The one pictured here is the result of a collaboration with Fakespace laboratories. It consists of a spatially-aware, high resolution, touch-sensitive LCD display and a microphone/speaker configuration. We are currently exploring the ability to integrate viewpoint, voice and marking annotations for 3D virtual environments with the Chameleon. For more information and images click here. True 3D displays in which a "voxel" is excited in a 3D space offers more spatially realistic 3D viewing experiences compared to the traditional 2D pixel oriented displays. 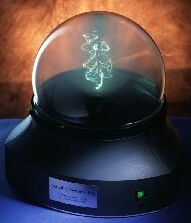 These volumetric displays are now becoming more robust and readily available (the one pictured here is from Actuality-systems). New human-computer interaction designs must be developed and adapted to effectively work in these 3D displays. We have begun exploring this design space of interaction techniques and input devices that may be well suited to this new class of 3D displays. This joint research is being conducted along with Professor Ravin Balakrishnan and Professor Gordon Kurtenbach. This research explores the use of physical artifacts to control, organize and manipulate digital information by offering a hybrid interaction dialog that exploits the affordances of physical artifacts and virtual media. By using a variety of physical objects we allow users to employ a larger expressive range of gestures and grasping behaviors for human-computer interaction dialogs. Furthermore, this design allows us to leverage off of a user's innate spatial reasoning skills and everyday knowledge of object manipulations. I'm really open to exploring a broad range of issues related to human-computer interaction including mobile, wearable, ubiquitous computing, augmented reality, novel input and output devices, and the fundamentals of human perception and motor control.